India is a land of farmers and it has crossed a long way in the development of dairy industry ever since the white revolution in 1970 which transformed India from a milk-deficient country to largest milk producing nation in the world with 18.5% global share. India generates a revenue of USD 75 Billion of revenue with an annual milk production of 155.5 MT while the Indian Dairy market is estimated to double in the coming decade. Laying a strong and stable dairy farming foundation will be crucial to meet the mounting demands of milk and capitalize on the growth potential. It is important to address some major challenges faced by the dairy industry like low animal output, poor farm management, lack of veterinary care and animal health assistance, improper feed management, insufficient finance and others to list a few. The Indian Dairy industry comprises of small scale dairy farmers, medium scale and large farm owners who work in collaboration with private sector dairies and cooperatives which provide excellent support to these farmers. Besides the existing policies, the government needs to devise plans and strategies for the sustainable development of both the farmers and dairy industry by providing them required access to resources and benefits of these schemes. Earlier, the private players have made several efforts to establish large scale dairy farms to achieve high productivity from low operating costs, improved product quality and increased profits. However, owing to the limited access to resources, government policies, high operating costs, lack of proper knowledge and large funding has led to minimal success in their initiatives. The prevailing diversity in the farming systems, existing infrastructure, topographies, climatic conditions, farmers’ capabilities, and sociocultural facts will determine the scope of commercial dairy farming in the country in the approaching years. 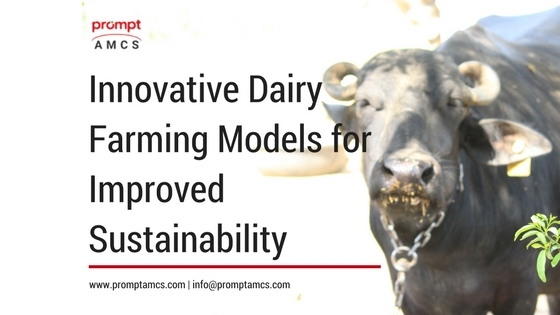 A few innovative farming models surfacing in dairy farming are mentioned below. The large scale dairy farms comprise of crossbred cows and a private set-up constituting milk processing machines, feeding system and storage facilities. The ownership, responsibilities and maintenance are held by the private player. They may also establish a mutual contract with the farmers to regularize the supply of fodder which is important for cattle to produce good milk. The milk is either used to produce derivatives and other products at its own plant or sold to other dairies. This model is beneficent to scale up the dairy farm operations, trace end to end production, and control processes. There will be mid-size dairy farms with 300-500 cattle animals coming up in future as they possess an edge in business with effective labor management, fodder and veterinary services. The owner without investing much money can achieve consistent supply of good quality milk and provide all financial and technical support to the farms. The government hosts various breeding programs and lends support to marginal farmers for purchase of cattle. Due to limited capital investment by progressive farmers and lack of a comprehensive system to ensure regular checks on farm operation by the owner pose challenges for this model. But if farmers and processors get into a mutual partnership, the model can certainly provide benefits to all the stakeholders. The model is based on community dairy farm setup in China where milch animals from the neighborhood are raised and taken care of. The private player largely invests in the farm infrastructure while the ownership of the farm lies with individual milk producers who are responsible to manage cows and their shelter with the assistance of private player. This lets the small scale farmers gain benefits of technology and resources. Many private players provide financial support and technical guidance to the farmers through tie-ups to expand their cattle size and scale up dairy farm operations like feed management, building proper infrastructure and implementing modern breeding practices. Do You Think the Dairy Farmers in India are Getting Fair Prices for their Milk? © 2018 Prompt AMCS. All rights reserved.